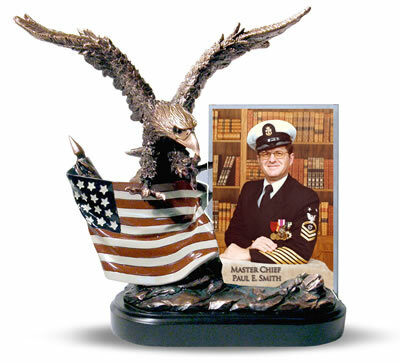 Beautiful three dimensional sculpture of an Eagle with the American Flag draped around the base. An engraved image with text is displayed on the right side. We transfer the image to a metal plate, engrave the plate with your special text and adhere it to the 4x6 glass. Size: 9" wide (including wing span) x 10" tall x 4" depth (front to back if placed on a shelf). It weighs 4 lbs. Comes in a white chip board box, ready for gift wrapping. 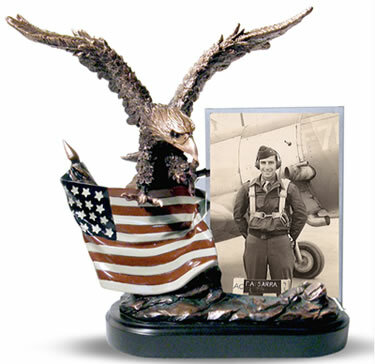 The faux bronze sculpture is a perfect memorial to a soldier. Display this sculpture on a table as a declaration of patriotism. Our dad retired and we gave this to him on his retirement. We used his name and rank. He loved it!